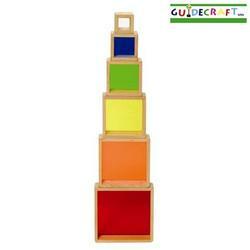 Six hardwood stacking squares feature inset colored plexi for stacking, sorting, building, sequencing and creating imaginative, colorful construction! Doubles as a stand-alone manipulative or an addition to hardwood block construction. Hardwood frames, rounded corners and edges, and inset acrylic plexiglass. Largest square measures 7" W x 7" D x 2" H. Ages 2+.